Hanes Field, named after John Wesley Hanes, who started the Hanes Hosiery Company in Winston-Salem in 1901, was the primary athletic field for both baseball and football at Trinity College - it appears to have been built in the mid-1910s.was a well-regarded facility - so much so that it was used for spring training by Boston in 1899, by the Durham Bulls upon the re-establishment of their club in 1913, and by the Trinity College Roosters. Trinity Athletic Field, looking southwest with the library in the background, 1909. Grandstands, looking north, 1909. These may have been the original grandstands from the racetrack. 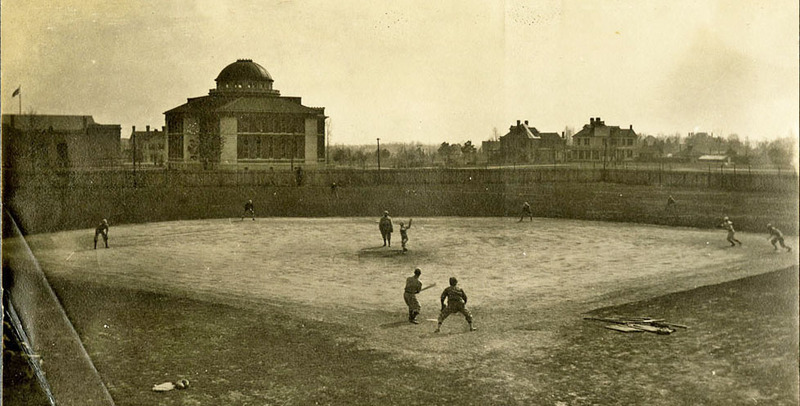 Baseball games seemed to be well accepted as the principal intercollegiate sport of the day, and the field was a well-regarded facility - so much so that it was used for spring training by Boston in 1899, and by the Durham Bulls upon the re-establishment of their club in 1913. University President Crowell was instrumental in establishing intercollegiate football at Trinity, believing strongly that the sport was an essential part of the development of the students. The Trinity College Roosters (yes, Roosters,) wore blue and white and played against familiar faces - State College (NCSU), UNC, Wake Forest. Wyatt Dixon recount stories told by HE Spence about early football and its abolition for ~21 years at Trinity. 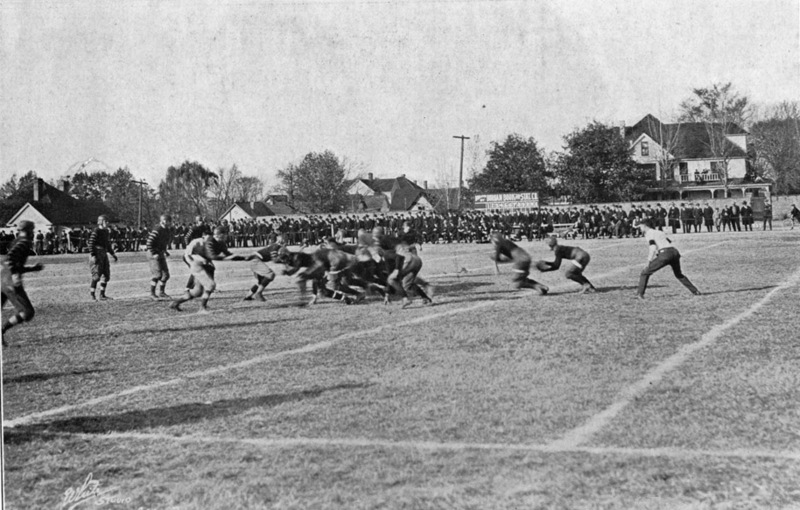 Football was an important part of the athletic program of Trinity College during the early life of the institution in Durham, as it is today with Duke University. For several years, the sport pitted Trinity against their rivals from the University of North Carolina and Wake Forest College, and with other teams also. Dr. Hershey E. Spence. in his book "I Remember” credits Dr. John Franklin Crowell, president of Trinity College when it was moved here from Randolph County with bringing football to the college. 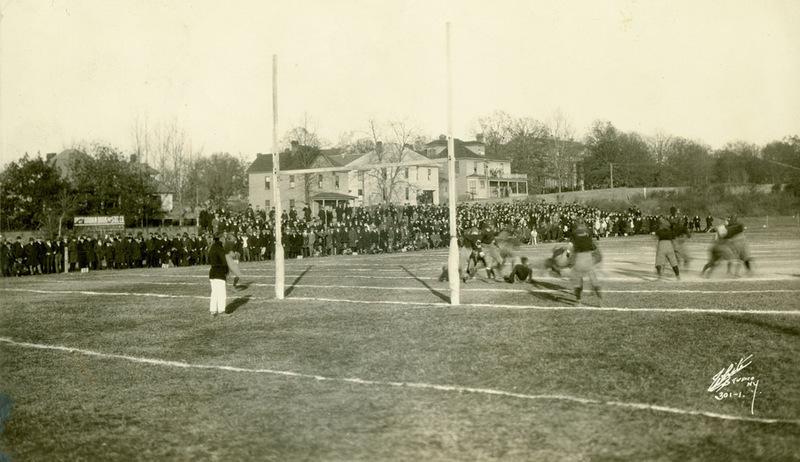 The sport was abolished later after Dr. John C. Kilgo, then president of Trinity and Dr. Robert L. Flowers, for many years prominently identified with Trinity and Duke, was "grossly insulted" at a game. Dr. Crowell played an active role in the football program of Trinity, coaching some of the earliest. Interest in the sport grew steadily, and in a few years "had grown to where enthusiasm was at a white heat," Dr. Spence said. Some of the scores were so small they sounded like baseball scores. One game ended with the score of 6 to 4. The extreme in high scores also was noted. According to the football report in the book, Trinity defeated the University of Tennessee by the score of 70 to 0 and took a game from Furman by the score of 96 to 0. The Trinity team scored so often and so fast that at one stage of the game the referee noticed that Furman had only ten men on the field. The captain was discovered leaning against his own goal post. When ordered to come on down and get into the game he replied: 'No thanks, they’ll be here again in a couple of minutes. I’ll just wait for them here. The type of refereeing was a source of complaint and criticism and complaints were made of the unfair play by opposing players. Dr. Spence tells in his book of a game between Trinity and the University of Virginia. Trinity forfeited the game because the referee was ‘cheating’ them. Trinity claimed that the Virginia team was either offside or held the Trinity players, which violations the referee admitted seeing but declined to do anything about. As a result the Trinity team walked off the field. Opposition to the game gradually developed throughout the state. Complaints were made that the game was too rough. . . . President Crowell wrote a lengthy article defending the game and hailing it as one of the greatest of morale builders. But the opposition mounted. The Western North Carolina Conference of the Methodist Church passed resolutions declaring it would not support Trinity financially if it continued the barbarous sport. It is not quite clear what was the final 'straw that broke the camel's back.' Rumor had It that the final decision to abolish the sport came after a game in which President Kilgo and Dr. Flowers were grossly insulted at a neighboring institution. It is not certain as to whether or not the offenders were students, but a group of persons are said to have shaken their money close under the noses of these two gentlemen and in obscene and profane language dared them to bet on their team. Football was discontinued intercollegiately but was allowed as a campus sport between classes until the end year of my college life. Then one day a student broke an arm or and President Kilgo forbade any further participation whatever in the sport. Hanes Field, named after John Wesley Hanes, who started the Hanes Hosiery Company in Winston-Salem in 1901, was the primary athletic field for both baseball and football at Trinity College. - it appears to have been built in the mid-1910s. In understanding the background in these two photos, it's helpful to know that the northwest corner of what is now East Campus was part of Old West Durham until the 1920s - note the position of "A St." (i.e. 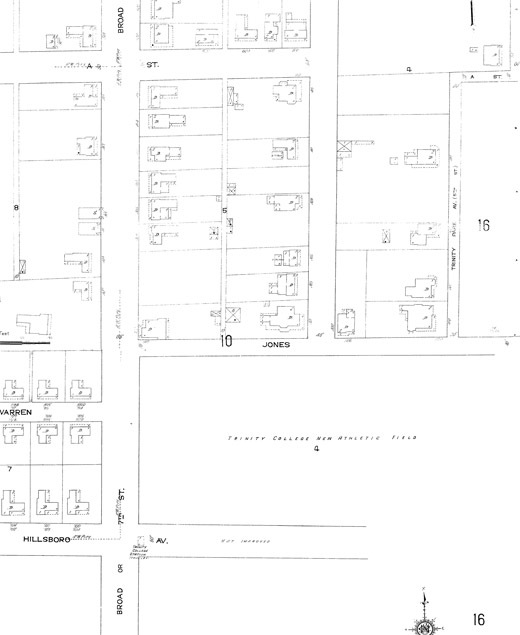 West Markham) and Broad in the map below - with Jones St. and Trinity Park Ave. forming an inside corner that has since been claimed by Duke. Trinity Football, with Alumni Memorial Gymnasium in the background, mid-1920s.